Posted on Friday, December 6th, 2013 at 9:26 am by Ty Anderson. I have encountered many spreadsheets. Some have been quite elegant. Most were Spartan yet useful. And not-insignificant number were downright dreadful and incomprehensible. The elegant ones are delight to code against. They have structure and order. The dreadful ones are difficult to code against due to their unpredictable structure. Yet, these ugly spreadsheets are the very ones that test our mettle as Excel add-in developers. I went ahead and named this range “Sample”. I will refer to it throughout the code sample. It’s Spartan… but it is useful for today’s topic. So, what do I mean by “last used cell”? I mean the last cell in a row or column that is used in one way or another. Meaning, it isn’t empty. It has a value, a formula, formatting, a comment, etc. Taking a quick look at the MSDN reference material, UsedRange is a property of the Worksheet object. If you access it ask it to tell you its secrets, it will give you a Range object. This range will contain all the cells in the worksheet that have ever contained a value. This means if a cell doesn’t contain a value now but did a few moments ago, UsedRange will gladly serve it up to you. It will keep this secret to itself and leave it to you to read the documentation. Thus, UsedRange can be unpredictable. Some developers go as far as to call it unreliable. I like to take these things one-at-a-time. When I say “contains data”, I mean the cell does not contain an empty string. It has something in it that is visible to the user. 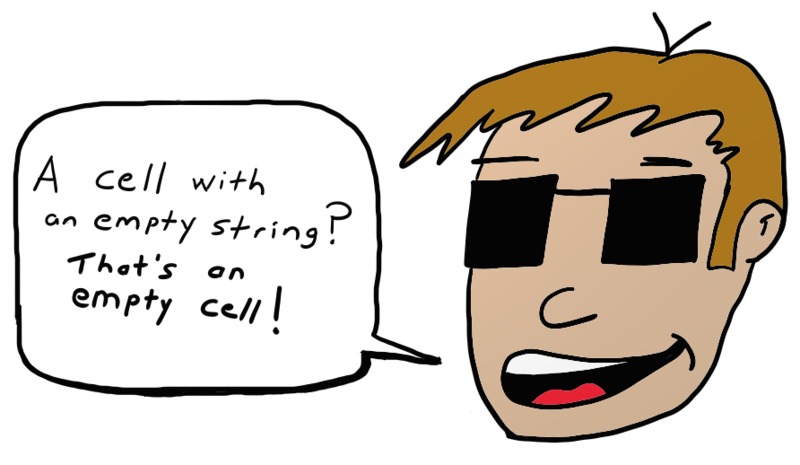 To a user, an empty string in a cell is an empty cell. We’ll start simple, with a procedure named MoveToLastCellWithData. All it does is mimic the CTL+ARROW keyboard combination in Excel. The procedure accepts an XlDirection parameter and then moves the cell selection in that direction. Below is how it can be utilized in a button click event. Here, I create a range reference to the active cell. I then pass it on to MoveToLastCellWithData so that good things will happen. For the few samples, I want to utilize the SpecialCells collection. This collection resides under the Range object and lets you reference several types of special cells. I decided to create procedure that will let me pass a range along with the type of special cells I want. The procedures assumes I am asking it to tell me (by way of selecting it) which cell in the range is the last of this type. The method access the special cells and stuffs them into a range (cells). With some tricky math, it then selects that last cell. And here is how to make the same call but find the last cell containing an Excel formula. One last example with MoveToLastCell. This one finds the last cell that has data and a comment. Not impressed, let’s look at other empty cells. How about an empty cell that contains a comment? The MoveToLastEmptyCellbyType is the procedure we need. It is meant to do for empty cells what MoveToLastCell does for data-filled cells. This should look familiar but the difference is we need to loop through the cells to check for the existence of a VBNullString or VBEmpty value. If we find it, we reference the cell and keep looping. Eventually the loop runs out and the last cell referenced is the last cell we are looking for. A call to MoveToLastEmptyCellbyType looks like these two examples. Because we are friends, I’ll admit that this one was a slight pain to figure out and implementing it in an Excel solution will be highly variable. I chose to keep it very simple by only searching for cells containing bold formatting. LastEmptyButFormattedCell begins by setting find format to bold. It then references the Sample range then starts a search using the find format. Dim firstCellAddress As String = ""
'Do we need to exit the DO...LOOP? 'grab the address of this initial cell. 'we need to get out of the loop. 'We found a formatted cell with an empty value...time to leave. 'We found, so select it to show the user. I coded this much like I would a VBA procedure. The loop will run forever if not for the check of exitLoop. I did it this way because of point #1. The search’s direction is xlPrevious (i.e. backwards). After the first search, I store the address of the first cell. If we return to this cell in subsequent loops, we know we didn’t find any empty but formatted cells. So we need to exit the loop. If we find a cell that matches the search, we need to check its value for an empty string. If we find one, we select it and end the procedure. If we don’t fine one, we tell the user. There might be a more elegant way to achieve the same thing. But this one tests out. But finding hidden cells is a different matter because no SpecialCell constant exists for hidden cells. Instead, we need to rummage around the sample range and consider the row and column of each cell. 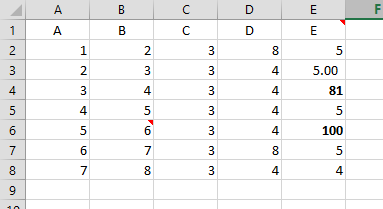 If either the row or the column is hidden, then we now that cell is hidden. 'Loop through the cells and find the last one in the range that is hidden. The ShowLastHiddenCell procedure loops through all cells. If any cells were hidden, it will show the address of the very last hidden cell it encountered. What about performance when dealing with large worksheets or ranges? This is always a limiting factor. I intentionally used a sample named range to keep from searching every cell in a worksheet. The more cells I’m searching the slower my add-in will perform. Thus, you need to implement strategies to ensure you are working only with a range of cells that makes sense for your scenario. If need to scan the entire worksheet, so be it… just display a “working on it” icon of your choosing so your user knows you are, uh, working on it. It sure would be easier if the Excel object model allowed us to do this in straight-forward manner. But, if Microsoft did that, what would we do with ourselves? Thank you for posting. This was very helpful. I have a question regarding a spreadsheet that contains textboxes. I am writing a macro that will find the last cell that contains data (xlCellTypeLastCell)moves out a few rows and columns, fills the column and row with a color, resizes the column and row, then hides all columns and rows outside the border. It is working well, but it currently does not recognize text boxes. I would like to add the functionality of finding the last cell with data OR any text box, then performing the aforementioned tasks. Is there a function similar to xlCellTypeLastCell that I could use to add this functionality? Thank you in advance for your help! The Debug.Print command produces “Forms.TextBox.1″ for me. You can use this to check whether an OLE object is a text box or not.